Here is a Big News. A Re-Volt Girl is created, so you are able to get quickly various information and news. However, Unfortunately She doesn't have name. so She needs to get your ideas. Name and Get Crystals Bonus!!! Re-Volt Girl will be with you next month!!! 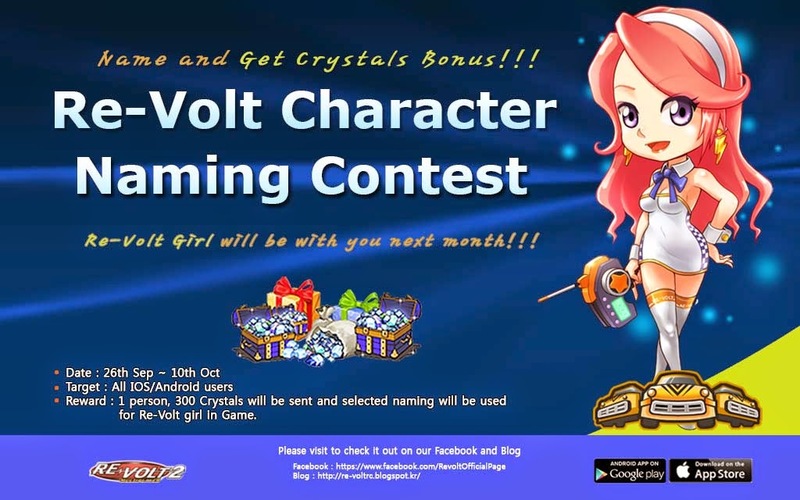 Reward : 1 person, 300 Crystals will be sent and selected naming will be used for Re-Volt girl in Game. How to write a comment : Re-Volt Facebook or this Blog. Let's Play your Re-Volt 2 : Multiplayer!! Marcy, since it has the letters RC in it. * Crys - like a short of Christine, but played around Crystal. Also hair reminds of crystals, has exact shine of it. Black уже писал ник в игре blackapollo777 добавляйтесь ввконтакте Alexandr Anatolievich на аве лётчик в шлеме селфи на истребителе!